Blog Post written by Nana Ferdnance (bottom row, second from left). Photos from folks in the program. 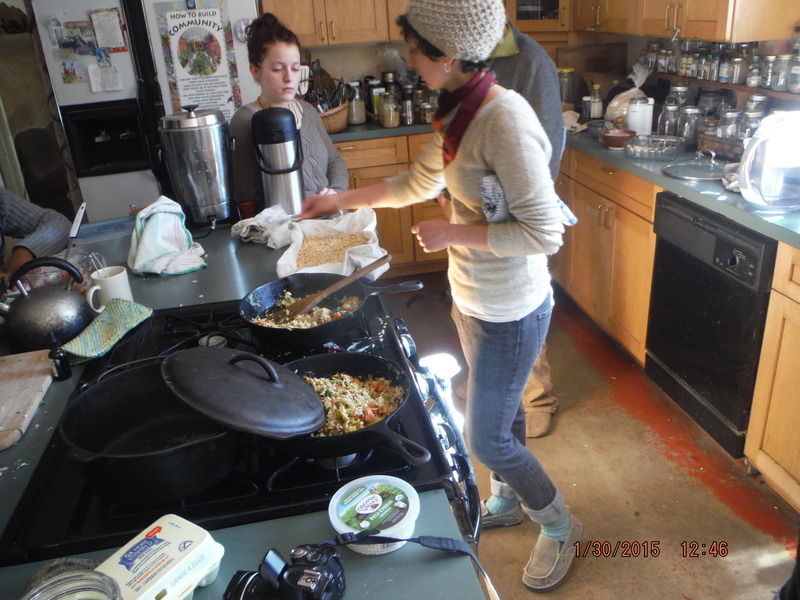 The official Winternship of 2015 began with the Full Moon Potluck. To avoid last year’s extreme weather, Adam and Brett came earlier two days earlier while Natalie, Dean, Jenny, Harry and Nana, came on Sunday January 4. Throughout the week, we introduced our background and interests for learning the basics for natural building. These basic techniques included learning different latching techniques and harvesting poles. Then we began to make steps to our first round pole frame by making accurate measurements of round pole frames, whittling needles for thatching and making purlins. Thatching the Woodshelter we made of lashed round poles. Being eager interns, we constructed and designed a small round pole frame for a wood shed to be used for the thatching workshop. 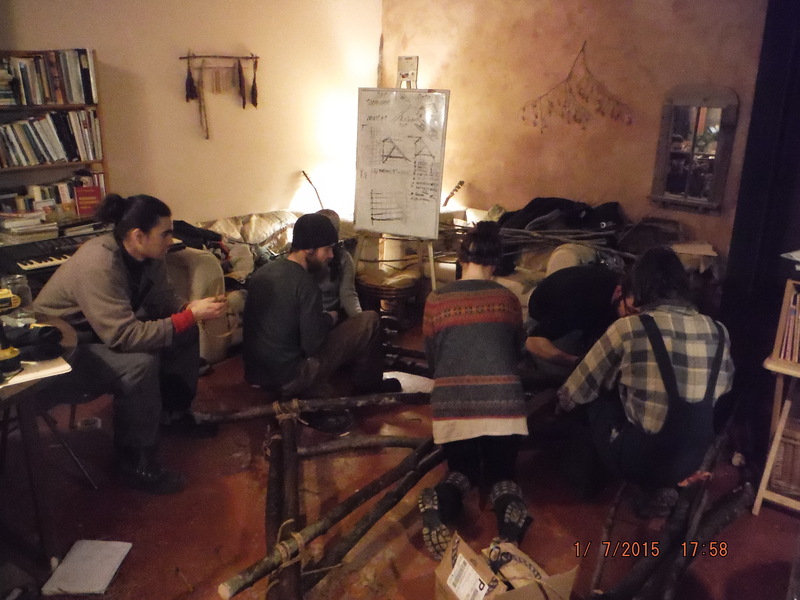 However, the weather prevented people from coming to the workshop, so all eight of us Winterns did the thatching workshop on Saturday. 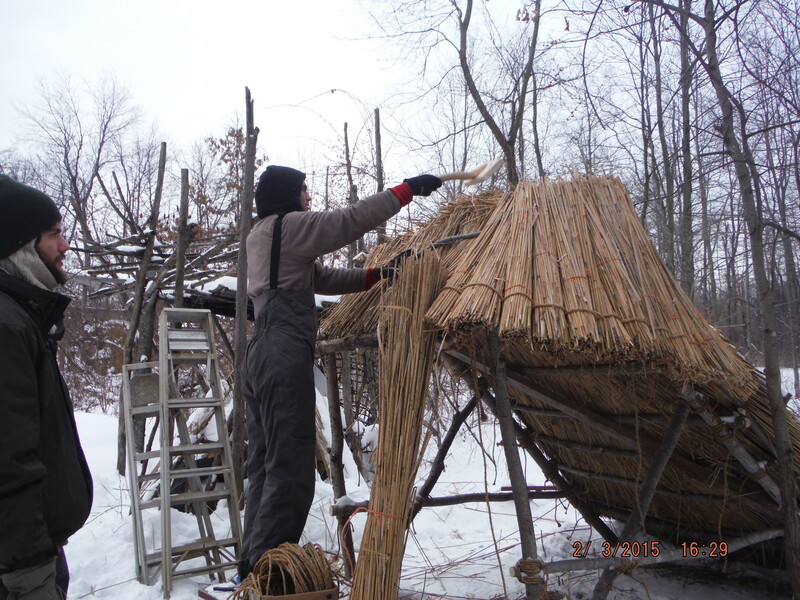 We used the phragmites that were already in the Red Shed and thatched on our Round Pole Frame with the clove hitch knots. (If you want more information, contact Deanne!!) During the week, we also prepared for future workshop of Round Pole Framing by harvesting poles and debarking for mallets. Hanging out in the evening in the main house. In between all this hard work, we also did a lot of fun activities! Some of us went to a relaxing yoga session, participated in the spiritual chanting of Kirtan, harvested hickory bark and made tea, and spotted wolves. We even went to a Non-Violence Communication meeting and spoke about handling dangerous situations in a calming, and rationally manner. Our creativity came together in a Drum circle named Lady Grace and the Winterns, where we experimented the tambourine and included spoken word in our lyrics from the classic-but-oh-so-imaginative novel, Charlotte’s Web. 😉 Creativity was also present in our cooking. 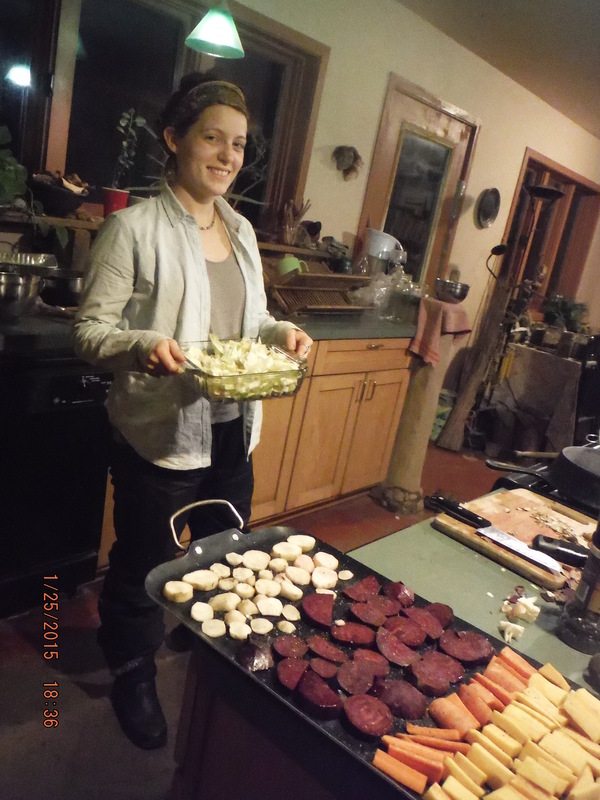 With all our dietary restrictions, we were still able to create mouth-watering meals of Daal and Squash soup, Hummus, rolled oats, brownies and we even managed to cook sweet potato fries on the Rocket Stove. 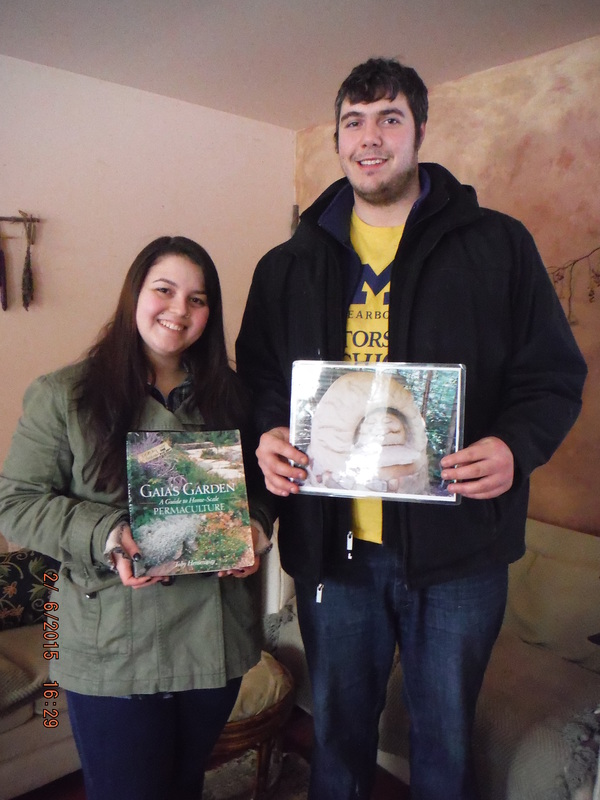 Some of our activities included gaining more knowledge about permaculture. This included going to Jim MacDonald talk about Stress relief and Healing Herbs. The Stress Relief and Herb talk was so eye-opening because Jim MacDonald eloquently spoke about the origins of stress before mentioning the stress relief power of herbs. Overall, the first week excitement and unforgettable experiences! 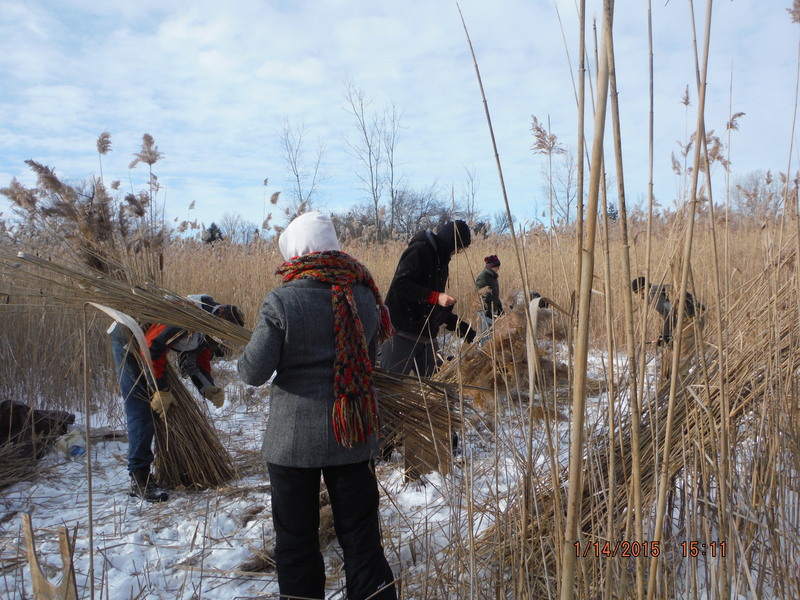 Harvesting reed (Phragmites Communis) in local field. This week began with our day off on Monday!! It was bittersweet because one of our winterns, Natalie, had to drop out from physical pain. (You are missed, dear Natalie!) 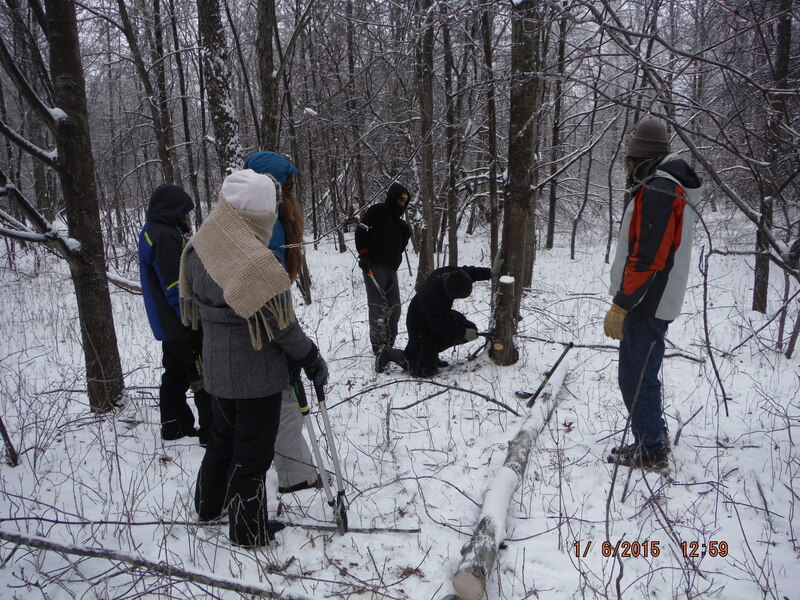 But some of us went bird watching at the frozen wetland while some winterns spotted Chaga bark and made some tea. On Tuesday, we focused on composting systems on Strawbale Studios, including the famous compost furnace. Adam helps with Compost Furnace testing in the Strawbale Studio. The compost furnace process was so intriguing, especially to Adam who has some ideas for further improving the compost furnace system. 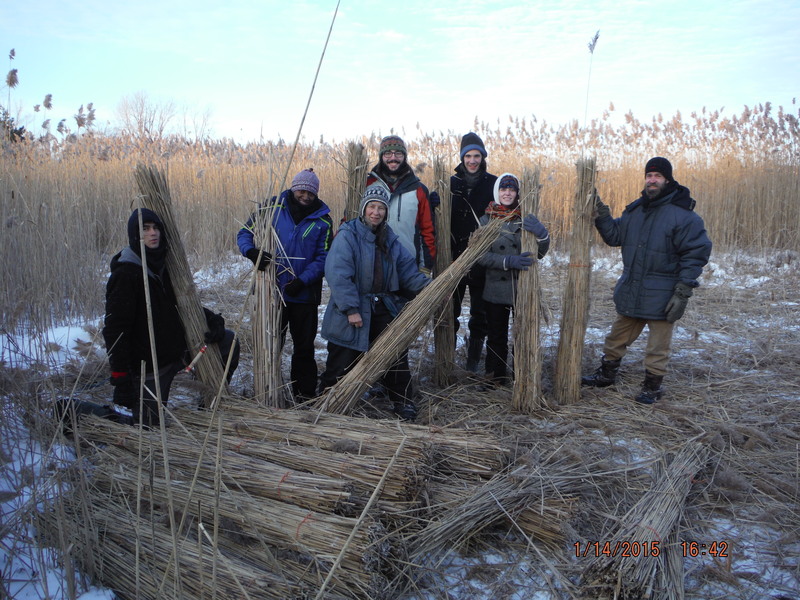 The next day, our main focus was Reed Harvesting with our good friend, Dawn! One of our interns, Harry, mentioned how Reed harvesting was a rewarding and relaxing process in terms of using the sickle to cut the reed and using the lash-and-quick-release knot for reed bundling. We all agreed and harvested 20 bundles before the Permaculture Monthly meet-up. (Check out our picture above!) 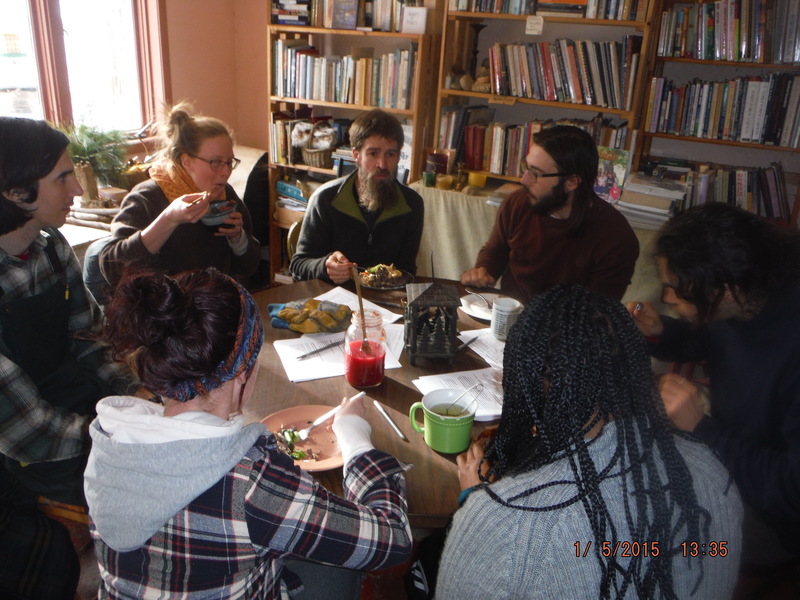 This month’s Permaculture meeting was about sprouting in urban residences. 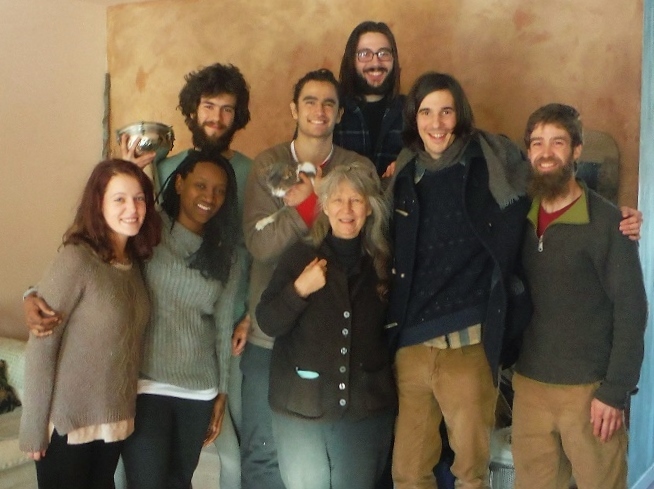 Also, we were given the opportunity to mingle and connect with fellow Permaculture fanatics. Harvesting poles from the woods. The next few days involved preparing for the Round Pole Framing workshop by chopping and harvesting wood for the Rocket Stove and cleaning the red shed and the main house for guests, including a new friend, Belle and Wintern, Trevor. 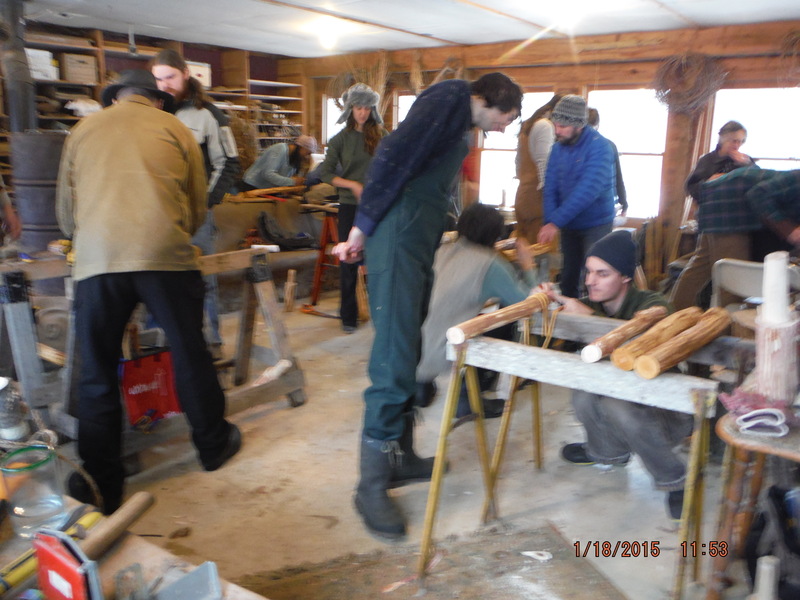 During the Round Pole Workshop, we helped our guests harvested poles, made mallets and then gave them a tour of the Strawbale Studios, living Wood Shed, Kids Cottage and Hobbit Sauna. To end the day, we all watched the Ben Law Video on Round Pole Framing, which was extremely helpful for design ideas and principles on Round Pole Framing. Making round pole notches in teams. With these design ideas fresh in our heads the next day, we came together in groups of three and made A-frames using lap joints, saddle joints and mortice and tenon joints. 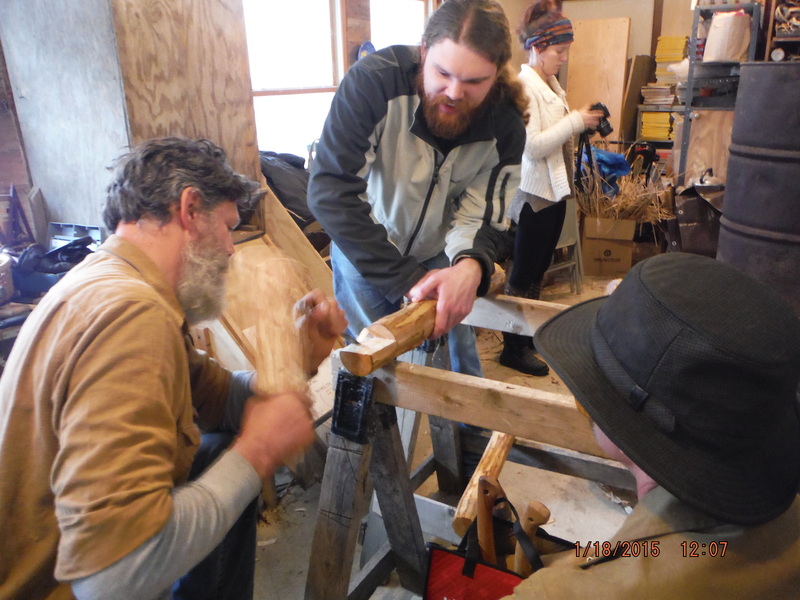 One group included three of our guests, PJ, George and Micah, who made an A-frame with only mortice and tenon joints, one of the most difficult joints. In addition to the incredible Round Pole Workshop, we did more fun activities. Mornings in Strawbale were filled with wetland runs and bird watching. In the evening, Lady Grace and the Winterns continued to evolve with more interns and instruments including the phragmites and kalimba. The visual arts was also present with the winterns with ceramic buttons and soup bowls, whittling, Japanese ink painting, figure painting. We also learned how to harness and climb trees form our expert climber and wintern, Dean. What an eventful week at Strawbale Studios! Dean presents his tiny house projects. This week, we began to reflect on what we wanted to accomplish in our time here at Strawbale Studios. We first took time to appreciate the learning experience from Deanne and our personal experiences with each other. As a group, we decided that our main accomplishment was to finish thatching the woodshed. 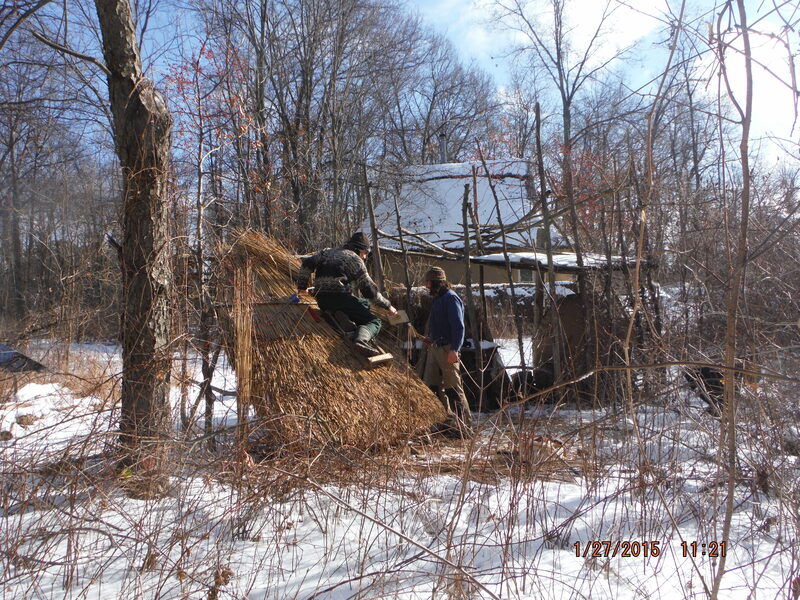 Feeling empowered and productive, we organized our schedule so well we not only included thatching the woodshed, but we also included Reed Collecting, site consideration and foundation class, checking the compost furnace, watching the Building Code video and Alone in the Wilderness. Dean was even able to tell us about his experience with building a Tiny House on his homestead. Very informative and inspirational! Our schedule also include more exciting activities during our days off such as Hickory Bark Foraging with Brett, Adam, Trevor and Belle! Robin, our very good friend from the Round Pole Workshop, hosted the Women’s New Moon Potluck, while the men went on a Permaculture Farm Tour with Robin’s husband, Greg. To top off an amazing evening, we had dance party! Cool beans!! Speaking of beans we had, delicious food this week including Bean and tofu burgers, barley with beans and oyster mushrooms, and tomato soup! We also learned and experimented with the wild fermentation of sauerkraut, water kefir, injera and shitake mushrooms. 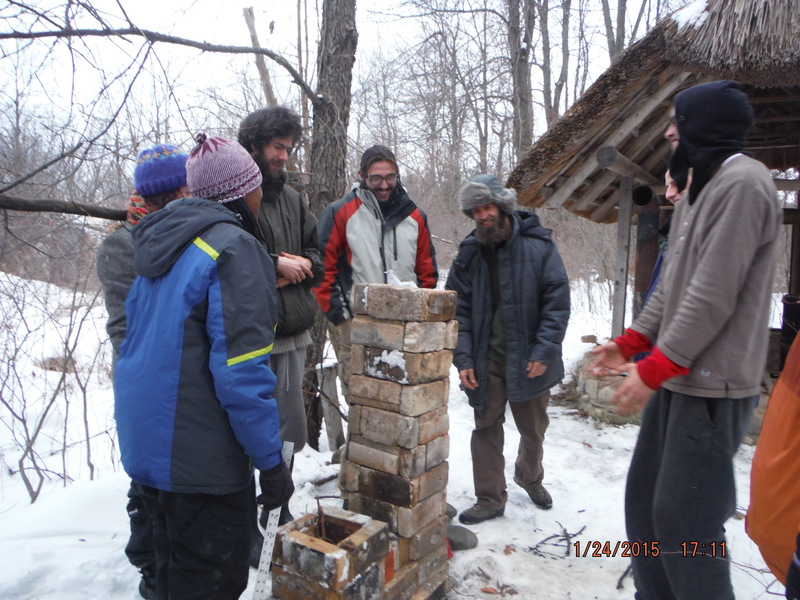 This weekend, we learned about the amazing Rocket Stove. With our guests, Tony, Margaret and Sarah, we went for a tour through Strawbale Studios and discussed the evolution of fire efficiency. We learned that a Rocket Stove is more efficient than a wood stove because the exit temperature from the chimney is low, perhaps 130 degrees (instead of 200-500 degrees like a wood stove) and the heat is redirected to heat a room. We also made cob bricks and earth mortar and reconstructed the Rocket Stove at the Kid’s Cottage. 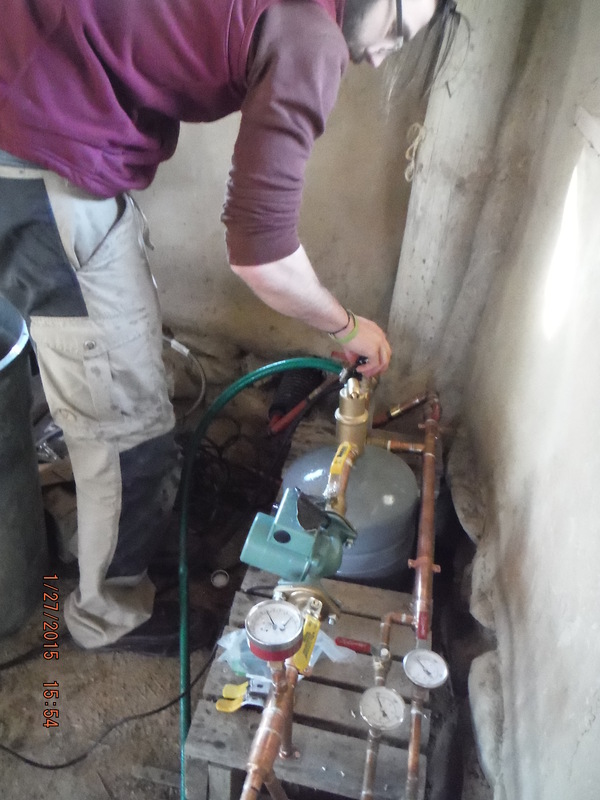 Rocket Stove Workshop – constructing a mock-up of the combustion unit. 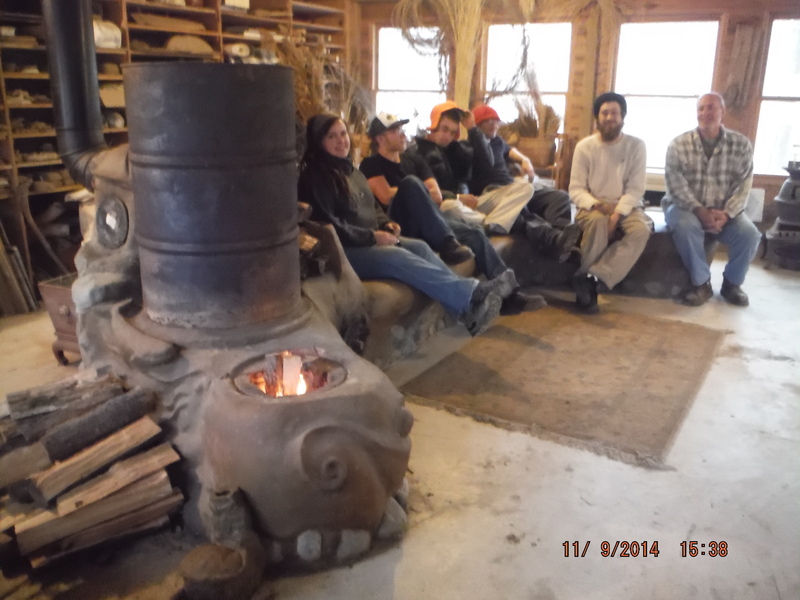 The next day, our guests started the Rocket Stove in the Red shed, made Rocket Stove models with the cob and had an informative Skype call with Chris McClellan, who opened our minds to the possibilities of Rocket Stoves. For more information, contact Deanne Bednar !!! This week was not only bittersweet because it was the last week together but also because Harry and Dean were leaving early. (We will light a candle for you!!) 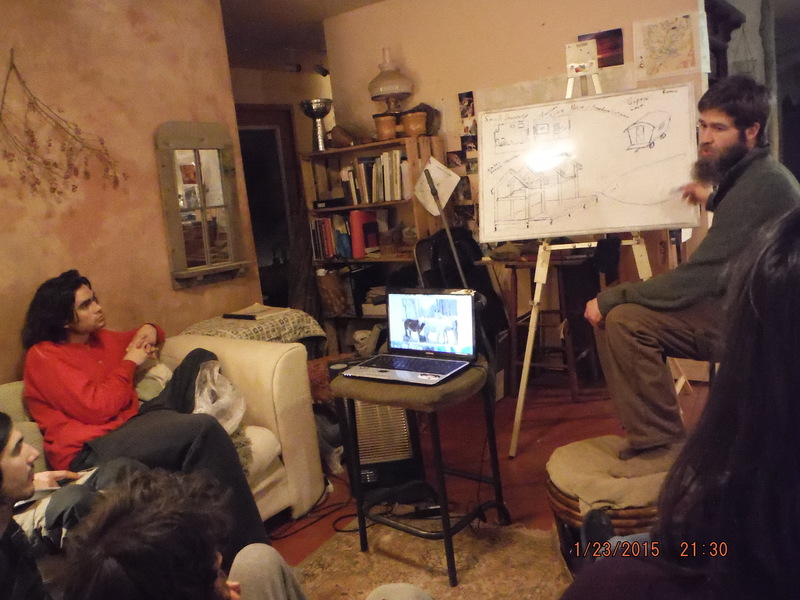 Since Harry had to leave on January 30th, Deanne gave us an Earth Plaster/Strawbale Introduction class which included the various uses of Strawbale because of its insulation resistance. We also continued to go reed collecting and thatch the woodshed, which was finally finished! 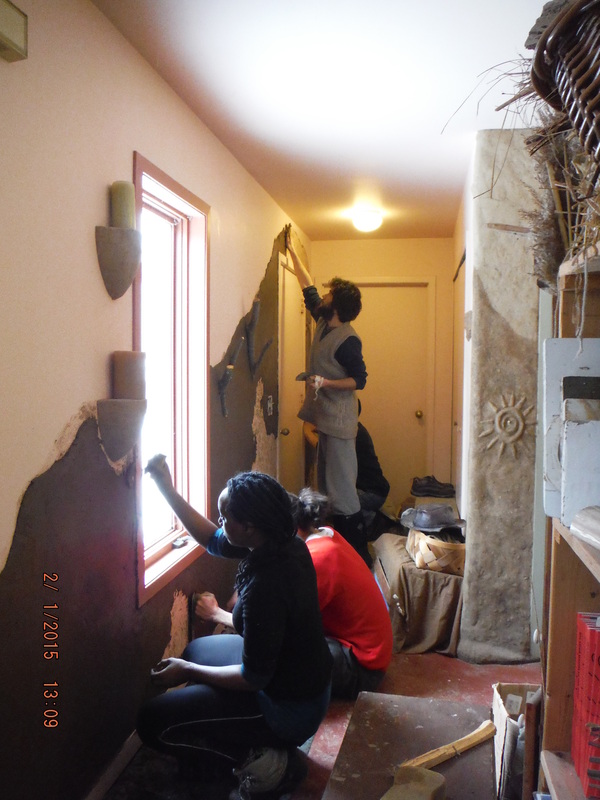 As for the Earth Plaster workshop, we gained knowledge about the process and materials of earth plastering with our guests, Derek, Stephanie and Amanda. The first day of the workshop included becoming familiar with the materials such as the starch paste for the adhesion coat, applying the adhesion coat to different walls in the house and making cob, which was later put on a test board and burnished. Applying Earth Plaster to the front hall during the Winternship. 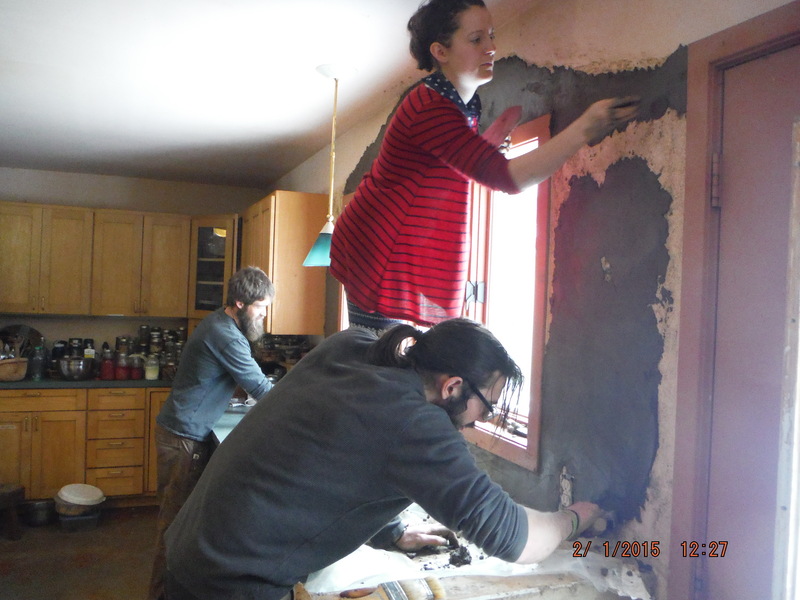 As our brains filled with the process and materials of earth plastering overnight, we made and applied cob on the walls all over the house, especially above the kitchen sink and in the front hall. The application of cob on the wall stroke some with a creativity streak to embed various scenes on the cob wall such as tree roots, mountain ranges and a moon/UFO. Whoa! Learning to use the hatchet. Our last week here also sparked for lots of exciting activities to take place. On our days off, we played contact and had a whittling class with Mark Angelini. 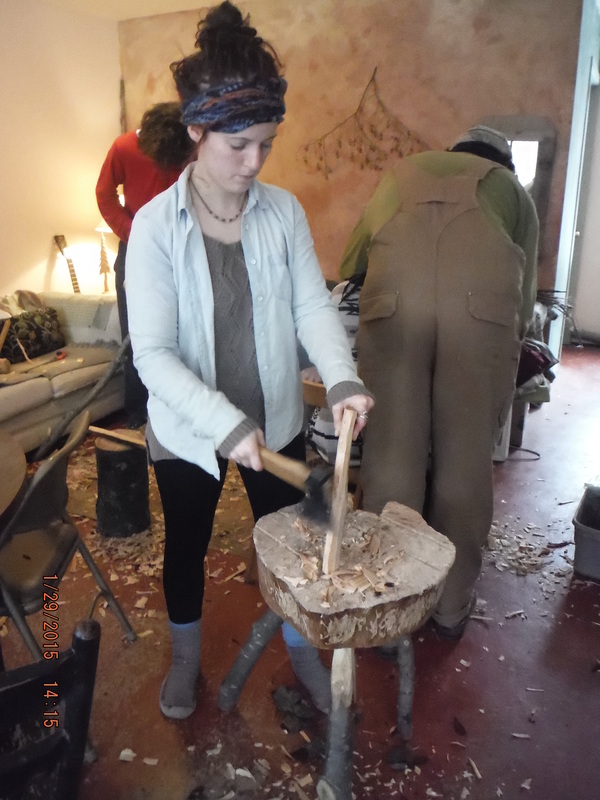 In our free time, we had a Tempeh class with Kerry, did worm composting, cording, made a saw horse, whittled utensils and of course had dance parties in between. We enjoyed banana ice cream, chocolate, stuffed avocadoes, more Tempeh and injera flat breads. During Dean’s last night here, we played games in the kitchen and had a blast playing in the evening snow! The last night of the Winternship was the Full Moon Potluck, where we savored more food and went for a wetland adventure at night! 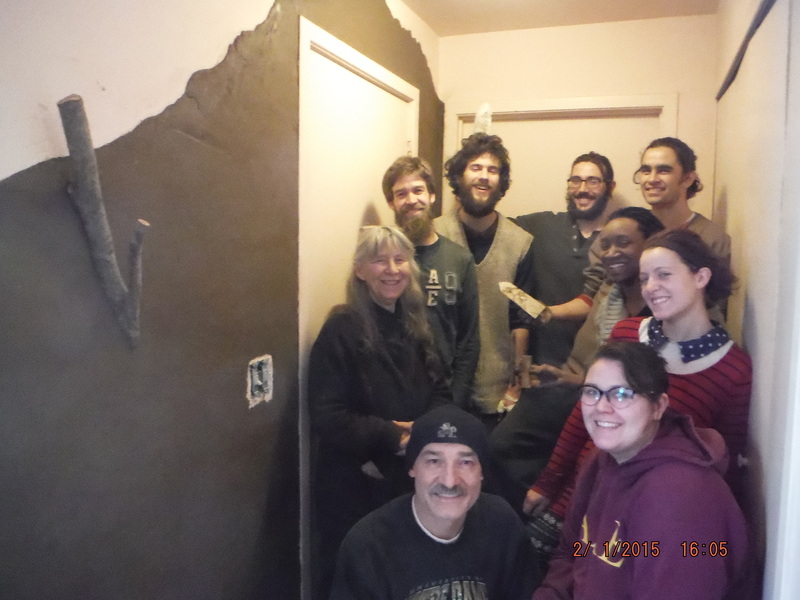 The Earth Plaster Team !